Rama Kased is director of student services and oversees academy coordinators within San Francisco State University’s Metro Academies program. Rama Kased shudders whenever she thinks about the nearly 40 percent of students throughout California State University who drop out before their junior year. That sobering statistic alone motivates Kased and others at San Francisco State University to continually fine-tune and upgrade their Metro Academies program, which is credited in large part for 87 percent of its participants remaining enrolled by their junior year. Begun in 2009, SFSU’s Metro program resulted from restructuring the curriculum for freshmen and sophomores who choose to enroll in the program. Metro cohorts are mini-schools within the university that each enroll up to 140 students. Every Metro cohort has a career theme focused on real-life issues in the neighborhoods where students typically live: health, science and child development, to name a few. For two years, every Metro student takes two linked courses per semester with his or her peers. The courses count toward all academic majors that SFSU offers. Although these students simultaneously take other lower-division courses with non-Metro freshmen and sophomores, the Metro classes are geared specifically for bolstering math, writing and public speaking skills and the ability to juggle deadlines. Metro participants overwhelmingly fall into one or more of the following categories: first-generation college student, Pell Grant eligible, underrepresented racial minority or undocumented immigrant. Latinos make up about 48 percent of Metro students, followed by Asian Americans at 24 percent and Blacks at 10 percent. Most Metro freshmen at SFSU are double-remediated in English and math. Universitywide, about 46 percent of undergraduates are Pell Grant eligible and 30 percent are first-generation college students. The socially responsive curriculum in each Metro cohort encourages students to think critically about their day-to-day realities, says Kased, who is director of student services and oversees academy coordinators within Metro. For example, students in the health cohort learn to make graphs by tapping real-life public health databases about their own neighborhoods, then write letters to the editor at local newspapers about their discoveries. Participants boast an average 3.04 GPA, compared with only an average 2.77 among their non-Metro peers. Throughout the Cal State system, the average time to a bachelor’s degree is six years. But at SFSU, about two-thirds of Metro students finish a bachelor’s within five years, resulting in significant cost savings for the state of California. Because of Metro, the state saves about $17,800 in education costs per student, compared with their counterparts at other Cal State institutions who currently don’t have access to anything akin to Metro. In order to finance instructor salaries plus program costs, Metro requires an additional $944 per student for the freshman and sophomore years combined. Similar to that at SFSU, City College of San Francisco houses a Metro program in which about 63 percent of participants earn an associate degree in three years, versus only 13 percent of nonparticipants. Plans call for SFSU to add three more Metro cohorts this academic year and for CCSF to add one more. Grants have facilitated program expansion at both institutions, and officials are considering replicating Metro elsewhere in California. 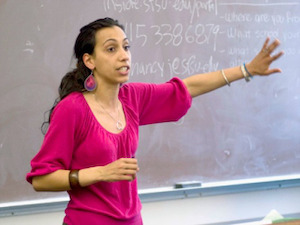 Kased and others credit not only Metro’s engaging curriculum with boosting undergraduate retention rates, but also its services such as academic counseling, tutoring and financial aid support that’s important for students who typically commute daily to campus from homes throughout San Francisco, Oakland and surrounding municipalities. The small size of Metro classes — usually 50 students maximum — encourage camaraderie, unlike the lecture halls of 200 or more in non-Metro, freshman and sophomore courses at SFSU. The fact that Metro participants come from disadvantaged circumstances means that they can learn and gain confidence from each other without fear of being unfairly judged or stereotyped. “We believe every student can make it,” Kased says. Furthermore, Metro instructors undergo about 45 hours of professional development on successful learning strategies, says Dr. Mary Beth Love, co-director of Metro Academies and chair and a professor of health education at SFSU. This is important, she says, because college faculty typically are experts in fields such as physics or literature, which can too often relegate the art of teaching to the backseat. Teacher preparation within Metro, Love adds, helps address the failure of higher education systems to adequately serve disadvantaged populations.